Tall (6'2"), dark and improbably handsome, like the old-time film idol he never quite became, Timothy Dalton has had a varied career on stage, screen and TV. He played with the National Youth Theatre in 1964, did a stint at RADA and quit to join Birmingham Rep . He has had some success as a classical actor, notably with the RSC and the Prospect Theatre Co . in the mid '70s, and roles in many TV series, including a fine Rochester in Jane Eyre (BBC, 1983) and Rhett Butler in Scarlett (1994), but, apart from his two appearances as James Bond , his screen career has been disappointing. 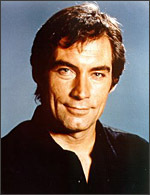 He was an unusually saturnine Bond in The Living Daylights (d. John Glen, 1987) and Licence to Kill (d. Glen, 1989), admired more by critics than the public. Other notable film roles included costume pieces such as The Lion in Winter (d. Anthony Harvey, 1968), Cromwell (d. Ken Hughes, 1970), Mary, Queen of Scots (d. Charles Jarrott, 1971, as Darnley), giving scope for well-bred derring-do. He had a long relationship with Vanessa Redgrave , whose husband he played in Mary and Agatha (d. Michael Apted, 1979).